Last week, Bunz, a social bartering platform formally launched #PayPeopleNotPlatforms, paying users with a stablecoin, BTZ (pronounced bits), for watching in-app advertisements or participating in branded surveys. Social media and digital platforms like Google and Facebook that exploit your personal data for their own purposes and profit be warned, this is one of the first ripples of a much larger consumer wave that is coming. Over $325 Billion was spent on advertising globally last year. Bunz believes that people should own the value of their personal data and that brands will pay people for access to that data. Welcome to the sharing economy where data is the new oil - what Airbnb did for accommodation, and Uber did for transportation, Bunz is doing for your personal data and time – rewarding you with BTZ for your attention and contribution to a networked community. Bunz first launched as a social platform allowing users to trade stuff with each other - my lamp for your carpet. A cashless barter transaction between humans is on the right side of the planet’s sustainable agenda when it comes to reusing “our stuff” and generating less waste and landfill. Founded in 2016, ironically as a secret Facebook community, the Bunz app has now completed over one million trades and can be found in every major city across Canada, as well as in growing pockets around the world - including Australia, the UK, the US, and Japan. In 2018 Bunz launched BTZ, a payment token, that is earned and spent with other platform users or redeemed at local retail shops. With a growing user base of 300,000 users, 200 retail shops, 3.5 million transactions in BTZ and over 80,000 wallets holding BTZ, Bunz is poised to take off. Sascha Mojtahedi, the founder and CEO of Bunz, is a man on a mission. The Bunz roadmap has been developed with its users (consumers) and partners (businesses) at the heart of its proposition. Rewarding Bunz users with BTZ for their data and participation in branded surveys and advertising is all part of the grand plan. Since the January 2019 beta launch of #PayPeopleNotPlatforms, businesses such as Lyft, Wealthsimple, and KOHO have sponsored Bunz surveys and collected valuable data related to their business, with over two million survey insights generated to date. Most importantly, advertisers directly compensate every Bunz app user who chooses to participate in the surveys. “We were excited to partner with Bunz as we're always looking to explore new, innovative ways to reach consumers. 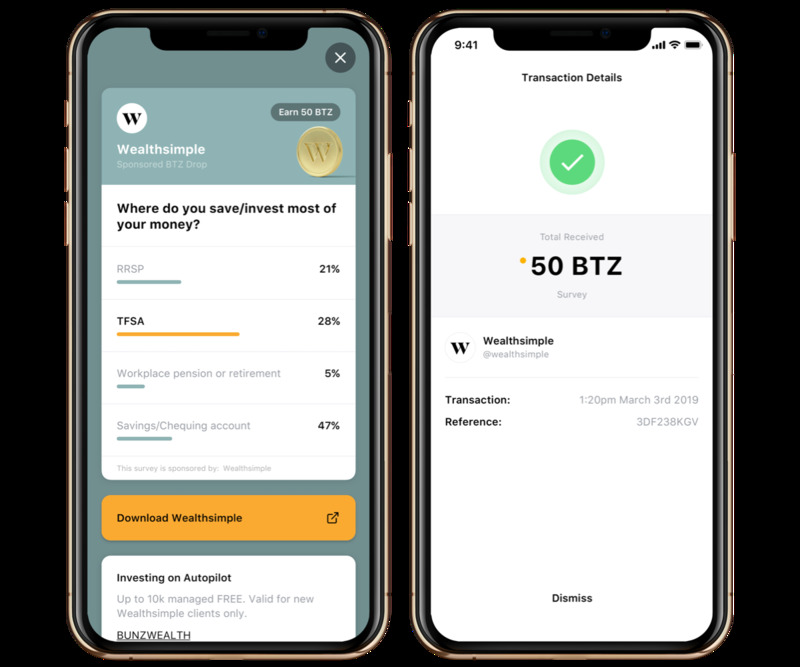 What really appealed to us about the Bunz platform is how transparent it is - users know exactly what information they're providing, and to whom,” said Kate Chippindale, Partnerships Lead at Wealthsimple. I caught up with Sascha to get the backstory on Bunz, an introduction to BTZ, how the token works, why it is so popular with consumers, and where BTZ and Bunz are heading in the future. Lawrence Wintermeyer: How did the idea for Bunz come about and when did you realize that a token could transform the consumer proposition and experience? Sascha Mojtahedi: Bunz came about because we all have too much stuff - it is a simple and fun way to post something you aren’t using anymore and get something you need in return while meeting some amazing people locally. As the number of barter trades approached one million in 2018, we realized we would need a currency to solve the classical economic issues that prevent bartering from scaling, the “double coincidence of wants”. BTZ solved these issues by ensuring people can transact even if they don’t have what the other person wants and has unlocked a greater potential for our marketplace. The Bunz community has done over 3.5 million transactions in BTZ already. The thing that makes BTZ special is that people can’t buy it - they earn it for their data, attention, and contribution to the Bunz community. The current social contract with platforms like Facebook is broken – you use their platform for free while they monetize your data for their profit. We created an alternative to traditional data monetization and advertising that serves people first. BTZ is a digital currency backed by the demand for data and attention, we like to call it data-backed money. The transformative piece is that BTZ is a spendable form of data that acknowledges its rightful owners – people not platforms. Data is the currency of the internet and we’re democratizing so that everyone can earn and participate in its value. Wintermeyer: What are people using BTZ for and what are the key features they like about the Bunz app and the ecosystem? Mojtahedi: People love Bunz because it connects them with other awesome people in their city and helps them live more sustainably through exchanging goods. People tend to accumulate a lot of stuff and are starting to realize that it is more cost effective and better for the environment to reuse instead of always buying new, Bunz enables you to find people to trade your stuff with. BTZ is used to complete barter trades when users don’t have what the other person want. BTZ can also be spent at over 200 local businesses in urban areas across Canada to do things like feed yourself: cafes, restaurants, and bars; groom yourself: hair, nails, and tattoos; or spoil yourself: clothing, records, and art. BTZ will soon be redeemable at shops in the US and Japan. Everyone on Bunz has a profile, can post items they aren’t using, can pay each other through the app with BTZ, and can review each other after the trade is complete. Wintermeyer: What do consumers have to do to earn BTZ? Mojtahedi: There are a number of ways to earn BTZ. By activating your wallet you earn BTZ, if you invite friends to the community both of you earn BTZ, if you post something that receives interest on the app, you earn BTZ, if you answer the daily sponsored survey you earn BTZ (over 15,000 people do this every day) and if you post something and trade it, you can earn BTZ. We are launching a number of new social and video features that will earn users BTZ for growing and maintaining the community. Wintermeyer: BTZ is an Ethereum smart contract, what makes it different from other payment tokens? Mojtahedi: BTZ is an ERC223 that you can send through a bridge between the Bunz app (centralized) and the Ethereum Mainnet (decentralized). BTZ is a stablecoin but it’s different than other stable coins in that when a brand pays Bunz for data or advertising, 60% of the money is deposited into a treasury and BTZ are released to the community for interacting with it. A problem with many cryptocurrencies is they force the responsibility of ownership on people. We made it easy for everyone to participate in the data economy through BTZ and provide people with the option of moving their BTZ from the app to Ethereum Mainnet, but we don’t force it on them nor do we make people buy it. What makes it particularly different from other stablecoins is it’s easier to use if you don’t understand cryptocurrencies and is earned for your data, attention, and contribution to the network. It’s some Robin Hood sh*t but with BTZ, instead of shillings. Wintermeyer: What has the retail merchant response been to BTZ, how quickly has the redemption network grown? Mojtahedi: Businesses love BTZ because it helps grow the community that supports their business by exposing them to new customers and helps them better understand what draws people into their shop, and how people like to spend. Some retailers are doing over 30% of their monthly transactions in BTZ with over $30,000 worth of sales in BTZ per month. In the last 12 months, people earned and spent $1 Million in BTZ at local businesses. We’re getting a lot of requests to sign up. We made data a spendable form of value and shops want to capture some of this new spending power as it’s not a share of an existing customer wallet. In short, businesses that accept BTZ are selling more by accepting data as payment and we ensure they can redeem it against a treasury for dollars. Wintermeyer: What are the key benefits advertisers have realized during the beta and how do you see this growing? Mojtahedi: Brands are realizing that with BTZ, there is an alternative to paying Facebook or other platforms to reach customers. It’s a non-zero-sum game on Bunz where brands get to interact with the community in a way that’s informed by data, while people are also being compensated for their information and engagement. Facebook and other platforms have faced a lot of backlash for their exploitative data practices, and brands who pay these platforms are making that exploitation possible. BTZ represents an alternative. Brands care about their customers and want to do right by them - they just didn’t have the opportunity before Bunz and BTZ. Wintermeyer: What are some of the new app features being planned on the roadmap? Mojtahedi: Platform features are becoming ubiquitous - it's washed out and nearly all of them offer something similar. You can expect Bunz to have the same features that the rest do but with the pay people not platforms mentality. The new social features will enable people to run groups that are geographical or interest-based. Admins can charge a fee in BTZ to members and earn for growing and maintaining their group. It’s a departure from how it works on Facebook today where admins aren’t compensated for their work. On the video front, we don’t want to give it all away just yet, but we are working on a “Speaker’s Corner” play that will give a vox pop platform to consumers powered by BTZ. Wintermeyer: Will we soon see Bunz and BTZ in other countries? Mojtahedi: Bunz just hired our first employee in San Francisco! We are planning on launching there as well as Los Angeles, New York and Tokyo in 2019. Anyone, anywhere in the world can join by downloading the Bunz app today, start earning BTZ and get trading with their local community. The launch of shops that accept BTZ is based on where the community is growing the fastest. So invite your friends - the faster your community grows, the sooner we will be launching shops for you to spend your BTZ! Wintermeyer: During such an exciting phase of growth, what keeps you up at night? Mojtahedi: What keeps me up at night is ensuring that Bunz creates a more sustainable future for everyone - economically, environmentally and socially. We are at an inflection point in history - we know what we are doing is not sustainable and needs to change. We believe there is a solution through better value distribution, by connecting people in meaningful ways and by reducing waste via better distribution of goods locally. I spend most of my time thinking about more ways to distribute value derived from data, attention, and contribution to a network back to the people that make it valuable.